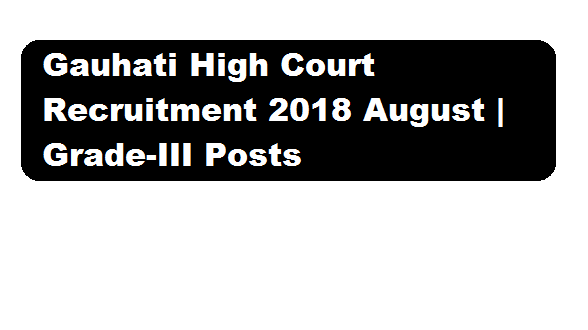 Gauhati High Court Recruitment 2018 – Grade-III of Nagaland Judicial Service :- Gauhati High court has recently released a recruitment notification in the month of August 2018 for GRADE III posts. According to the latest Gauhati University Recruitment 2018, Applications in prescribed form are invited till 5.00 PM of 21st August, 2018 from candidates, for the following posts who in Grade-III of Nagaland Judicial Service. In the below sections we have mentioned every details related to this recruitment. In this section, we will discuss in detail about Recruitment of Grade III posts under Gauhati High Court Recruitment 2018 with all the details and requirement. No of posts : 03 [2 (two) existing vacancies + 1(one) anticipated vacancy] Educational Qualification: Applicants must be a holder of degree in law granted by a recognized University established by law in India. Age Limit: Must not have completed, as on the last date fixed for receipt of applications, 38 years of age in the case of candidates belonging to Scheduled Castes or Scheduled Tribes and 35 years of age in the case of other candidates. The duly filled up application form in the prescribed format along with all testimonials should reach The Registrar, The Gauhati High Court, Kohima Bench, Kohima, Nagaland, PIN-797001 on or before the 21st day of August, 2018.The envelope containing the application form and documents should be superscribed as “Application for direct recruitment in Grade-III of Nagaland Judicial Service, 2018“. Self Attested copies of all documents in proof of the applicant’s educational qualifications, Bar Council’s Registration (if any), Age, Certificate of Practice(if any), Caste Certificate etc. along with 4 (four) copies of recent passport size photographs should be submitted along with the Application Form. Indian Postal Order (IPO) of Rs. 400/- (four hundred) only for General candidates and Rs. 200 (two hundred)only in case of SC/ST candidates, payable to Registrar, Kohima Bench, Gauhati High Court, Nagaland should also be enclosed with the application form.